My grandmother, Doris Scovill, gave me this hat in the late 1960s or early 1970s. At that time, she worked as a travel agent planning tours to Norway, Sweden, and Denmark. On her own travels there, she collected textiles and other decorative objects for the home that she used every day, and that still remind me of her. At that time, architecture, interior design, home furnishings, fashion, and jewelry from Scandinavian designers were extremely popular and influential in the United States. It is likely that my grandmother knitted this hat for me herself -- she was an accomplished knitter, and the hat has no label and looks handmade. I also recall her giving me a child’s cardigan with silver buttons in a similar style at about the same time, but I do not now recall if it matched the hat. 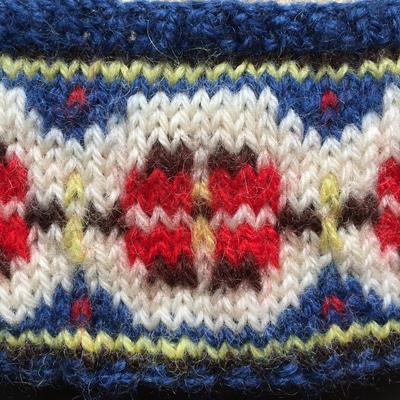 Commercial patterns were widely available for Scandinavian-inspired knits in the late 1960s and early 1970s. Perhaps someone will recognize the source of this hat design! 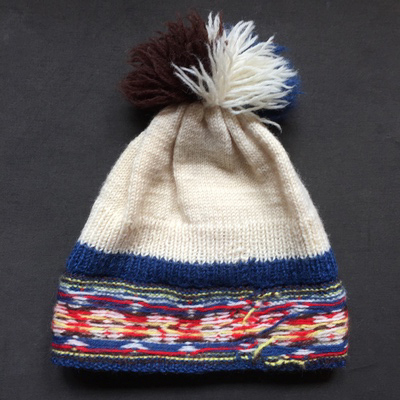 The hat is knitted in the round using wool yarn in five colors – natural white, dark brown, red, yellow, and blue. The colors are dyed -- the yellow, red, and blue are especially bright and intense -- a 1970s take on a color palette traditionally derived from plant dyes and natural fibers. The patterned hat brim folds up along a picot edge. 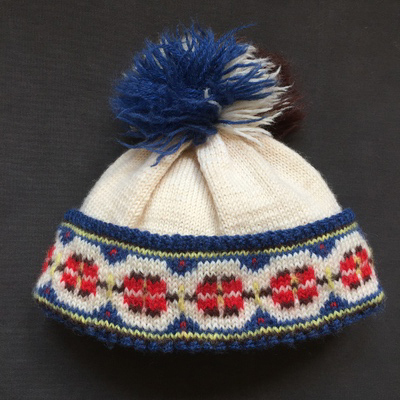 There is a large, tricolor "pompon" or "pom-pom" on the top -- a popular accessory in the 1960s and early 1970s.